○ Surah al-A’raaf (07), Yunus (10), Hud (11), Yusuf (12), al-Ra’d (13), Ibrahim (14), al-Hijr (15), and al-Nahl (16) were all revealed in Mecca, except for the last three ayaat of surah al-Nahl [16:126-128] which were revealed between Mecca and al-Madinah as the Prophet was departing from the Battle of al-Uhud. until the end of the three ayaat which were revealed in al-Madinah. until the end which were revealed in al-Madinah. ○ Likewise, the seven Ha Meem surahs (40-46), Qaf (49), al-Dhariyaat (51), al-Toor (52), al-Najm (53), al-Qamr (54), al-Rahman (55), al-Waqi’ah (56), al-Saff (61), and al-Taghaboon (64) were all revealed in Mecca except for the end of surah al-Taghaboon (64:14-16) which was revealed in al-Madinah. 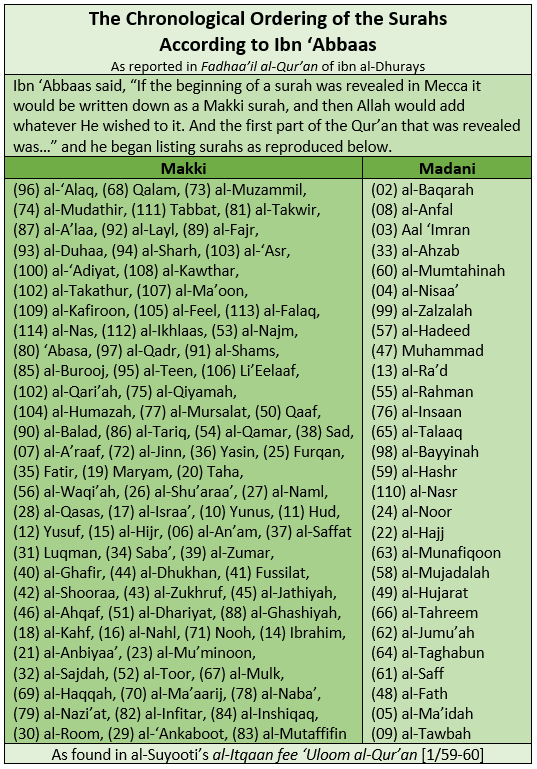 ○ Likewise, surah al-Mudathir (74) until the end of the Qur’an was all revealed in Mecca, except for: al-Zalzalah (99), al-Nasr (110), al-Ikhas (112), al-Falaq (113) and al-Nas (114), which are all Madani surahs. ○ And surah al-Anfal (08), al-Tawbah (09), al-Noor (24), al-Ahzab (33), Muhammad (47), al-Fath (48), al-Hujurat (49), and from al-Hadeed (57) until al-Tahreem (66) were all revealed in al-Madinah. This was how he reported it in its full length, and its chain of narration is good; all the men in the chain are trustworthy narrators from among the well-known Arabic scholars. 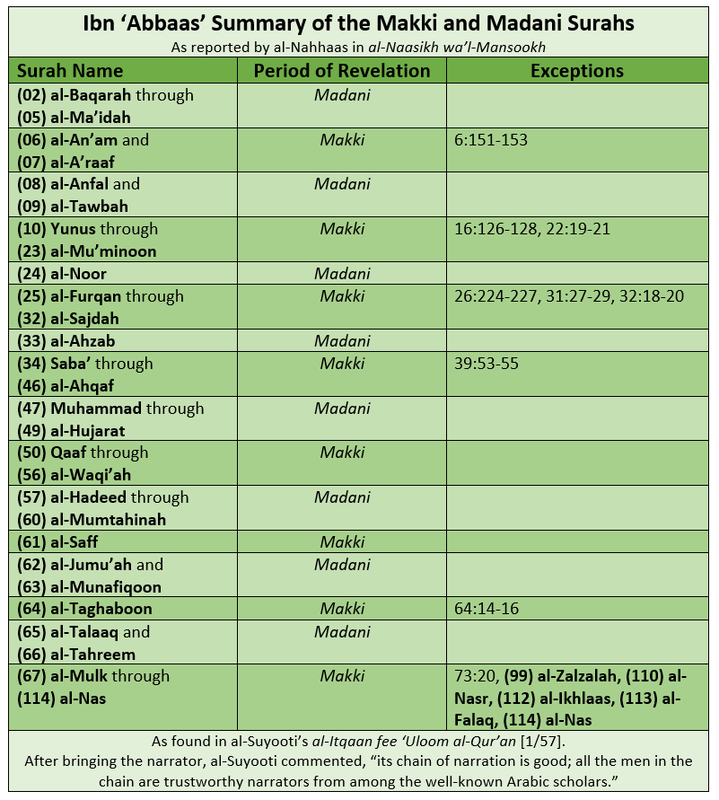 al-Bayhaqi also said … on the authority of Mujahid that ibn ‘Abbaas said, “The first part of the Qur’an that Allah revealed to His prophet was surah al-‘Alaq” and then he mentioned the same meaning as this hadith including the surahs that were missing from the first narration in the midst of the Makki surahs. And al-Bayhaqi also said: this hadith is supported by another found in the Tafsir of Muqatil and others, and it is sound despite being a mursal hadith, as has been mentioned before. 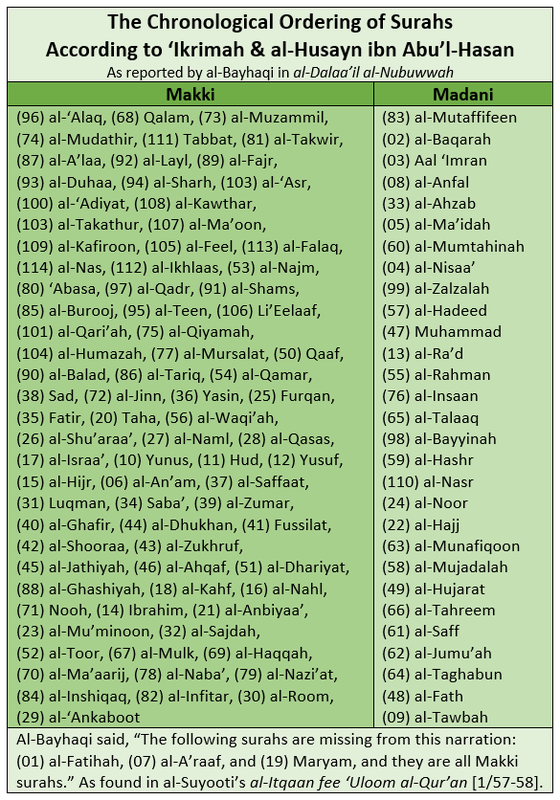 (02) al-Baqarah, (03) Aal ‘Imran, (04) al-Nisaa’, (05) al-Ma’idah, (08) al-Anfal, (09) al-Tawbah, (22) al-Hajj, (23) al-Noor, (33) al-Ahzab, (47) Muhammad, (48) al-Fath, (57) al-Hadeed, (58) al-Mujadalah, (59) al-Hashr, (60) al-Mumtahinah, (61) al-Saff, (64) al-Taghaboon, (65) al-Talaaq, (66) al-Tahreem, (89) al-Fajr, (92) al-Layl, (97) al-Qadr, (98) al-Bayyinah, (99) al-Zalzalah, and (110) al-Nasr. All the rest were revealed in Mecca. (02) al-Baqarah, (03) Aal ‘Imran, (04) al-Nisaa’, (05) al-Ma’idah, (09) al-Tawbah, (13) al-Ra’d, (16) al-Nahl, (22) al-Hajj, (23) al-Noor, (33) al-Ahzab, (47) Muhammad, (48) al-Fath, (49) al-Hujurat, (57) al-Hadeed, (55) al-Rahman, (58) al-Mujadalah, (59) al-Hashr, (60) al-Mumtahinah, (61) al-Saff, (62) al-Jumu’ah, (63) al-Munafiqoon, (64) al-Taghabun, (65) al-Talaaq, (66) al-Tahreem up until the 10th ayah, (99) al-Zalzalah, and (110) al-Nasr. And the rest of the Qur’an was revealed in Mecca. as well as al-Bayyinah and al-Zalzalah – which you should take as a warning! Translator’s Note: The current translation is limited to the first part of al-Suyooti’s promise, i.e. that he would begin by listing the narrations he had come across from the salaf on this topic. As for the second part of his promise, i.e. the follow-up comments about differences of opinions, then al-Suyooti made this into a separate section which may be translated in the future. Translator’s Note: Abu ‘Amr ibn al-‘Alaa’ al-Basri [d. 154 AH] was one of the seven famous reciters of the qiraa’aat, i.e. al-Dowri ‘an Abi ‘Amr and al-Sousi ‘an Abi ‘Amr. Translator’s Note: It would appear that ibn ‘Abbaas meant the large surahs before surah al-An’aam and not surah al-Fatihah, as he is recorded elsewhere as saying that surah al-Fatihah is a Makki surah. This entry was posted in Assorted Benefits, Explanations, Misc. Tafseer, Sayings of the Salaf, Scholars, Sharh al-Hadeeth, Tafseer and tagged 'Uloom al-Qur'an, al-Qur'an, al-Suyooti, poetry. Bookmark the permalink.